John and Yoko gave peace a chance in Canada . Beatles Radio: The Beatles, Solos, Covers, Birthdays, News The Fab 4 and More! 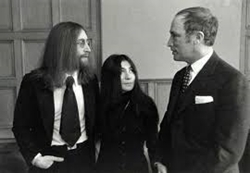 In the final year of the turbulent 1960s, as the Vietnam War and the massive counter-cultural protests against it reached new levels of intensity, John Lennon and Yoko Ono visited Canada three separate times. The purpose of these trips varied, but on the third and final one they achieved what seems to have been among their top priorities as the leading peace activists of the era: they met the prime minister of Canada, Pierre Trudeau. During John and Yoko’s first visit in the spring of 1969, they staged their famous “Bed-In” at the Queen Elizabeth Hotel in Montreal, lying down together for eight days in front of the world’s media to publicize their message of peace, and in the middle of it all recording their anti-war anthem Give Peace a Chance.